First known as Hen and Chickens Harbour, Collingwood was renamed in 1854 to honour one of Britain's most noted naval heroes, Admiral Lord Cuthbert Collingwood, second in command to Admiral Horatio Nelson. By 1843 settlers had arrived and located on the shores of Georgian Bay near to where Collingwood is now situated. This imposing structure can be seen for miles around Collingwood and symbolizes the twin engines of commerce in the early 1900s, agriculture and shipping. The lighthouse, constructed in 1855-59, is one of the most historic structures of the Great Lakes. Visible from the shores of Collingwood, the island itself is called Nottawasaga Island. Locals call it Clark's Island or even Lighthouse Island. The imposing limestone lighthouse soars 86 feet and serves as one of the few reminders of our bold and diverse marine heritage. Development started in 1941, with the Weider family moving into an existing farm at the base of the escarpment and is a major destination for skiers from southern Ontario. On average, Blue Mountain sells more than 750,000 lift tickets per year, making it the third-busiest ski resort in Canada. 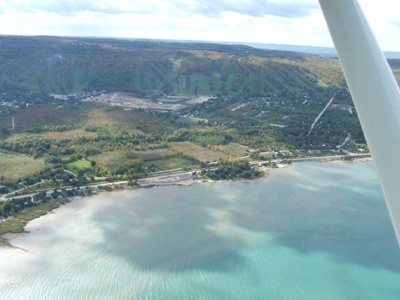 The Beaver Valley has formed over a period of several thousand years as the Beaver River cuts into the Niagara Escarpment. Today, the river continues to cut southward into the bedrock at Eugenia Falls. Gradual erosive processes have created a wedge-shaped valley with a width ranging from approximately 30 metres at the south end to 13 kilometres at the north end. The Valley and surrounding area are home to the quaint villages of Flesherton, Eugenia, Kimberly, Clarksburg and the Town of Thornbury. The Beaver River plunges 80 feet into the valley below. Tours provide stunning views of the gorge with its spectacular autumn colours. 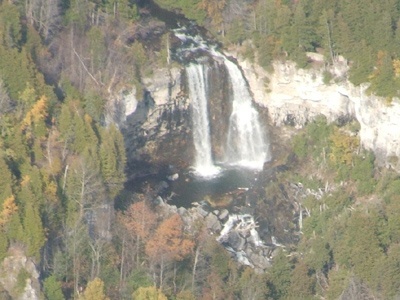 Eugenia Falls is a fairly well known waterfall, marked on many road maps. The waterfall is tall, but fairly narrow, as it does not usually discharge a large amount of water. The development of a nearby hydroelectric power plant diverts much water away from the falls. An event of national significance occurred at Wasaga Beach on August 8, 1934, with the first successful overseas flight from Canada to England. This location was chosen due to Wasaga's long, smooth, hard-packed sand beach. The airplane was named the "Trail of the Caribou." On August 13, 1814, three American ships arrived at the mouth of the Nottwasaga River, and found The Nancy hidden up river. The Nancy was subsequently sunk and the mouth of the river was blocked with debris by the enemy, which shut down the supply route. Originally, Christian Island was known by the Ojibwa as Gichi Minising (At the Big Island), but was also known for a brief period by the Hurons, as Gahoendoe. The three islands were, in the 19th century, collectively known as the Christian Islands: Beckwith Island was called Faith Island, while Christian Island, which is the largest of the three, was known as Charity Island. Home to several ship wrecks - The Mapledawn, Lottie Wolfe, Michigan, Thomas Cranage, Marquette, Western Islands - Dive On a Lighthouse!